Tonight on NBC their hit reality talent show AMERICA’S GOT TALENT returns for the ninteenth episode in its ninth season where six acts advance in a results installment. On the last episode, twelve of the top 48 acts performed live for the chance to win the $1 million prize and become the most talented act in America. Starring celebrity judges Howie Mandel, Mel B, Heidi Klum and Howard Stern. Hosted by Nick Cannon. One of the best acts last night was Mara Justine, Howie said she brought him to stand up in the middle of her song, it was so powerful and he couldn’t believe how at only 12 years old she sang so well. Howard said that she redeemed herself this week, she is a freak of nature in the best way possible; she has such a powerful voice for such a young girl. Did you watch the last episode? If you missed it we have a full and detailed recap, right here for you. On tonight’s show, the votes are in and six acts from the previous night’s performance show will move on to join the Top 12 acts of the competition. 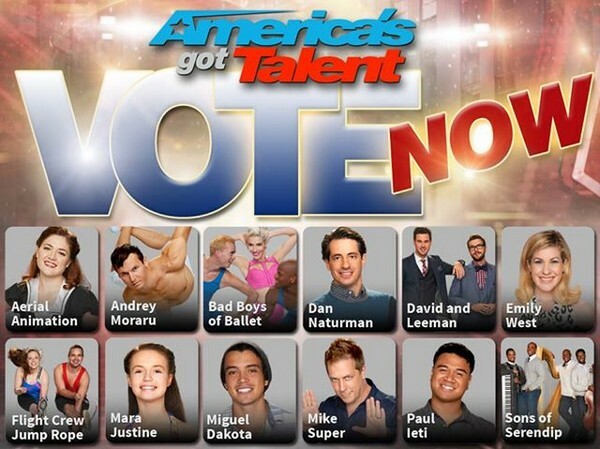 Did you vote so your favorites can go to the finals? The show is kicked off with a performance by Ariana Grande and right after we get a recap of all the acts we saw last night, giving us a reminder of what America has judged on; the judges were very harsh last night with the acts making sure they get the best act to win. The first act moving on to the top 12 is Mike Super with his amazing illusion last night, Mike is so amazed that he’s moving on and thanks Howard for his honest advice and Howie for bringing him back as a wild card pick. Howie says that he knows he is an amazing judge since his wild card moves on, he’s proud of Mike. Howie got bored and came to Radio City Hall helping people sit in their seats that they bought, he completely messed with them and made some people sit right on the floor at the front and keeps pointing a flash light in peoples faces and making them do really awkward things. The next act moving on to the top 12 is the Sons of Serrendip with their insanely moving and emotional song; the group thanks America and can’t believe that this is happening. Heidi says that she knew they had nothing to worry about, she knew they’d be coming to the finals. We get a segment of fans asking the judges questions on Skype, Michalel from Washington and asks Heidi what her idea of a perfect date though they buzz him out. They now get Piers Morgan and he can’t believe how horrible Nick’s outfit is, he asks everyone if Howie is one of the most annoying people on the planet Earth; Mel B agrees and Howie says he took so much pleasure to annoy him all day. Howard says he finds Howie talented and delightful. The next act moving on to the top 12 is Emily West and Howard says that she is a million dollar act, there is not much advice to give to a front runner; she can easily win this show. Now the other act going on to the top 12 is Miguel Dakota, he can’t believe he got to move on after he got a lot of flak from Howie and Howard last night; Mel B knows he’s got star quality and that it was no surprise he’d move on. The next act moving on to the top 12 Mara Justine, she starts crying right there and can’t believe it; she thanks everyone so much for voting for her. Howard says he’s so happy for her and that it must be an emotional rollercoaster, he knows she has a great gift and wants her to keep giving them lows and highs. Now we have David and Leeman and Ariel Animations as the two acts for the judges to choose between, Heidi says Ariel has amazing stories and mixing her dance and artwork together; though she loves David and Leeman, choosing them to go through. Howie says David and Leeman are great magicians, comedians and show men; they are great performers. Though Ariel does something they haven’t seen before, he goes with David and Leeman; Howard says he loves Ariel Animation though David and Leeman are the ultimate act of the two.